With this week's Valentine's offer, we have teamed up again with the highly popular Firenze Clinica, opposite Dundrum Town Centre, to offer you the perfect gift for him or her, the Baccara Roses Pamper Package. If you are tired of the usual chocolates and flowers, try a Spa Day to celebrate your love this Valentine’s Day. Have relaxing and romantic Spa Treatments during the day and then celebrate with a night out. What ever you choose, it will be a memorable Valentine’s Day filled with relaxation, pampering and love. 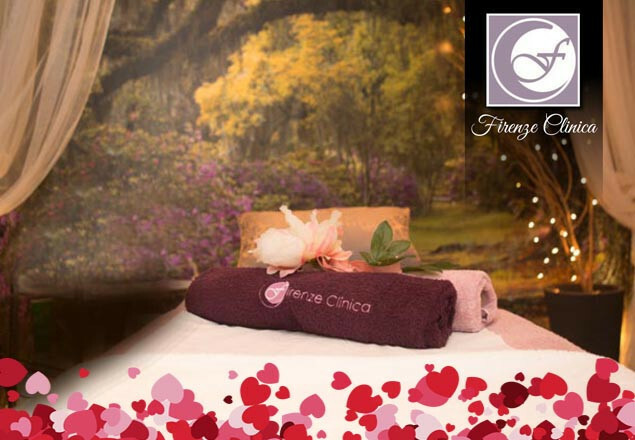 A perfect Valentine’s Pamper Package awaits you at Firenze Clinica, Dundrum. Based on Baccara Rose Extract - the most exquisite of roses - They're beautiful, they're intoxicating, they're seductive, and they have the most incredible benefits for both your skin and your mood, as of course Rose wouldn't be a Rose without its heady fragrance, prized for its relaxing qualities and and at Firenze, they utilize these oils in their purest form. Skin Analysis - Find out what your skin needs… Firenze's skin experts will provide insight into your skin’s past and present, create a treatment and recommendation based on their findings. Jet Peel Skin Rejuvenation - A revolutionary painless treatment that deep cleanses, exfoliates, hydrates, oxygenates and rejuvenates your skin and allows product to penetrate deeper. Using a high tech skin rejuvenation device with cutting edge technology, this treatment uses only air and saline solution as it exfoliates skin layers while oxygenating and hydrating the skin at the same time. The Jet Peel allows trans-dermal delivery of nutrient supplements, mesotherapy products, vitamins and minerals without the use of needles. It gives you a glow without any abrasiveness or discomfort after just one session. The Divine Bacarra Rose Facial - For when your skin needs a bit more help than what any of our Premium Facials can provide. This facial will enhance tissue firmness, reduce fine lines and wrinkles, minimize inflammation as well as stimulate collagen and elastin production on the cellular level. With the special Extract of Baccara Rose rich in Vitamin A, C, E, K and D, phospholipids and other highly concentrated peptides, your skin has no option but to respond! A truly heavenly experience! Winter Eye Treatment - This is a spectacular targeted treatment for the care of tired eyes. Thanks to the wrinkle-smoothing peptides and hyaluronic acid, the skin around the eyes becomes radiantly youthful again, swelling around the eyes lessens, and dark circles begin to fade.The treatment contains cleansing, Eye massage, Sweet Rose Eye mask. Oxygen Treatment - A safe, new idea for skin rejuvenation, which delivers results. It removes facial blemishes and tightens large pores. It's deeply cleansing and improves the elasticity and tone of the skin. It is known to remove scars, wrinkles on lips, under eyes and spider veins as well as acne and acne scars. This treatment restrains inflammation, accelerates blood circulation and repairs damaged skin. Full Body Brushing - The Body Brushing treatment will improve your optical skin quality as well as exfoliate your skin, boost blood circulation, aid the Lymphatic system, help reduce cellulite and in-grown hairs as well as invigorate your well being. Back, Neck and Shoulder De-Stress Massage - Soft lighting, soothing music and warm massage oils all enhance the enjoyment of this light to medium touch massage. Through the use of long strokes, kneading & petrissage, this calming massage will release stress by reducing tension & improving your circulation. Indulge, and feel tension slip away from your mind, body and soul.